Beverly Flight Center has been chosen exclusively by North Shore Community College to conduct all of the required flight training for the students enrolled in their Aviation Science Undergraduate Program. NSCC students are educated by our instructors using a thorough, performance-driven part 141 syllabus approved by the FAA in order to ensure training of the highest caliber. For more information about the undergraduate program, please visit the official program website by clicking here. The Aviation Science Professional Pilot program at NSCC provides students with the professional training necessary to become fixed-wing commercial pilots. It begins at the private pilot level, and prior experience is not required for admission. Students with previously earned FAA flight certificates and ratings may receive academic credit through advanced standing. The program combines classroom instruction and flight training in both aircraft and an FAA-approved ground simulator (Advanced Aviation Training Device). NSCC requires all students to obtain a minimum of an FAA Second Class Medical Certificate prior to acceptance in the program. Flight training requires a minimum 250 total flight hours, and includes 50 hours of dual instruction in the Redbird LD model Advanced Aviation Training Device. Coursework provides the knowledge required for pilot certification and ratings, and includes several FAA-approved ground schools which are conducted under FAR part 141. 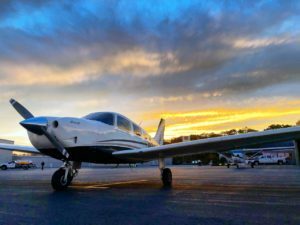 All flight instruction is required to be conducted by an appropriately rated FAA-certified flight instructor at the NSCC-approved flight training facility, Beverly Flight Center, and is conducted under FAR part 141. Total costs for flight training are approximately $41,890. Graduates are prepared for careers as professional pilots for regional airlines, corporate and general aviation, and government agencies such as the military and the FAA. Transfer agreements have been established with several Bachelor degree programs such as Embry-Riddle Aeronautical University and Bridgewater State University.